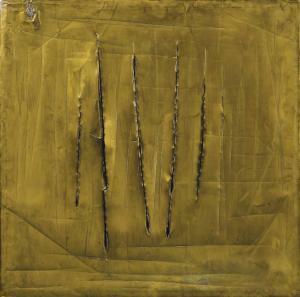 Find artworks, auction results, sale prices and pictures of Lucio Fontana at auctions worldwide. 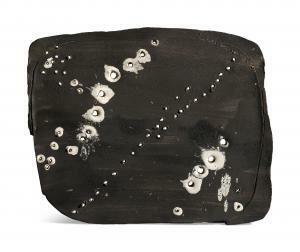 Lucio Fontana (1899-1968) Concetto spaziale incised with the artist's signature 'fontana' (on the reverse); stamped with number '2/2' (on the underside) bronze with black patina 8 7/8 x 7 3/8 x 8in. (22.6 x 18.7 x 20.4cm.) 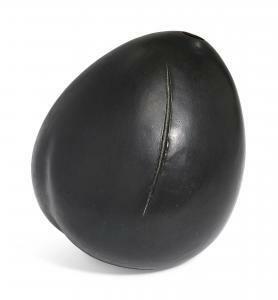 Executed in 1959, this work is number two from an edition of two Provenance Galerie Bonnier, Paris. Private Collection, England (acquired in the 1980s). 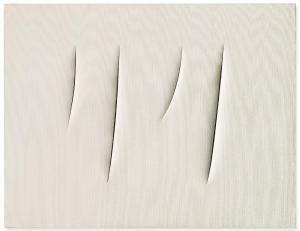 LUCIO FONTANA (1899-1968) Concetto spaziale, Attese signed, titled and inscribed \‘l. Fontana \“Concetto spaziale\” \“Attese\” 1+1-XYZZA\’ (on the reverse) waterpaint on canvas 35¼ x 45 7/8in. (89.5 x 116.5cm.) Executed in 1960 Provenance Galleria Arco d\’Alibert, Rome. Paolo Nazzaro Collection, Rome. Bernard Cats, Brussels. Acquired from the above by the present owner in 2005.